This paper is about CAD in the medical imaging domain. CAD stands for computer aided detection or computer aided diagnosis and the authors argue that both are important in assisting radiologists interpret abnormal features in medical images. The main novelty of this paper is the introduction of multiple classification ripple down rule (MCRDR). The goal of the present work is to extend the RDR approach to produce multiple conclusions for a given input, hence multiple classification ripple down rules. 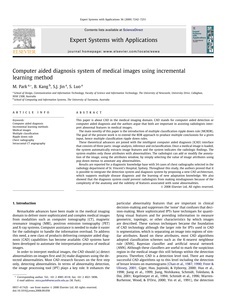 These theoretical advances are joined with the intelligent computer aided diagnosis (ICAD) interface that consists of three parts: image analysis, inference and reclassification. Once a medical image is loaded, the system automatically extracts image features and the system indicates the radiologic findings. The system enables only those attributes with abnormalities. The radiologist can add or modify the annotation of the image, using the attributes window, by simply selecting the value of image attributes using pop down menus to annotate any abnormalities. Results are reported for a diagnostic knowledge base with 34 cases of chest radiographs selected in the radiology department of St. Vincent抯 Hospital, Sydney. Throughout this study, the authors proved that it is possible to integrate the detection system and diagnosis system by proposing a new CAD architecture, which supports multiple disease diagnosis and the learning of new adaptation knowledge. We also showed that the diagnosis system could prevent radiologists from making misdiagnoses because of the complexity of the anatomy and the subtlety of features associated with some abnormalities.